Make Your Headlamp Shine Like New! Here on the Motorparts.ie blog we recently looked at ways of ‘winter-proofing’ your car. We touched upon the importance of replacing fading or burnt out bulbs, as well as regularly removing grime from the lenses. We’re going to look at this aspect in more detail this time around, because even though we’re beginning to see more of a stretch in the evening, having your headlamps in showroom condition makes a huge difference when driving at night. It’s a straight forward and affordable process that won’t take up much time, but one which will make driving at night all the more easy (and safe). It’s also a potentially huge money-saver – because you cannot simply replace the plastic on sealed headlamp units. If your car happens to be an expensive vehicle with high-performance lights then replacing this unit can cost hundreds of euros. However, with a few cheaply bought tools and products, and some all-important know-how, you can get your headlamps looking as good as new in under an hour for considerably less. 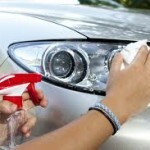 Start by washing away whatever grime and dirt may have built up on the surface of your headlamps. For a seriously deep clean consider using a rich gel formula such as Meguiars Plast-RX. The non-toxic formula effortlessly removes scratches, stains, cloudiness and oxidation. If you’re working on a tight budget then washing with warm, soapy water should suffice. There are a number of things to look out for once the surface has been cleaned. Hazing, yellowing and cracks are all tell-tale signs of wear and tear, and all can have detrimental effects on the effectiveness of your headlamp performance depending on how far along they are. Hazing and yellowing starts once the hardcoat is worn down. The surface subsequently absorbs more light (yellowing) and scratches (hazing). In terms of hazing, a cheap clean might do for reversing the effects. However, if the headlamps have a noticeable yellowish crust you will almost certainly require a more comprehensive treatment with professional products (such as Plast-RX or Meguiars Head Lamp Restoration Kit). Cracks on the lens will require professional resurfacing. Tip: NEVER use household glass cleaning products on your headlamps. These products have ammonia in them which causes plastic to turn yellow. Time to get abrasive. Sandpaper is used to wear away the layer of haze and/or yellowing that has built up on the surface. Have a few different coarse grades of sandpaper to hand. It’s generally advised to stick to finer (i.e. less coarse) grades for finishing, with one coarser grade to begin the cleaning with. You will be looking for an even, dull finish when using the coarser sandpaper. Then, switch to the finer sandpaper and continue the process until the dullness gives way to more clarity. Tip: There’s an obvious danger of scratching the surrounding paint when sanding the headlamps. Stick some tape around the edges of the headlamp. There’s a few options available to you when it comes to the polishing process. On the one hand you have a variety of different headlamp-specific buffing compounds (including the aforementioned Meguiars). Use a microfibre mitt (such as the Kent’s Microfibre Cleaning Kit) to apply the buffing compound. Work in a circular motion. It may take up to three buffing coats to get the finish you desire. If money is an issue there may be a number of household products that will do a temporary job. Bath tub and sink cleaners sometimes are effective given that they are manufactured for plastic – just ensure they’re non-abrasive. Toothpaste is another oft-quoted life-hack when it comes to cleaning headlamps. Avoid products with whitening agents, peroxide and additives. Blue toothpaste is said to be the best fit for this purpose.